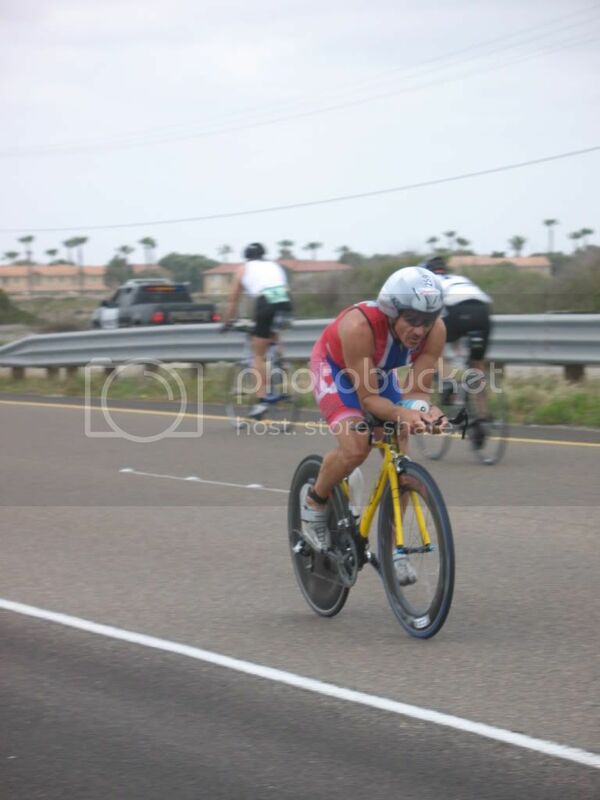 2012 Tucson Triathlon race report…extended weekend version. The weekend events started on Friday 3-23-2012. 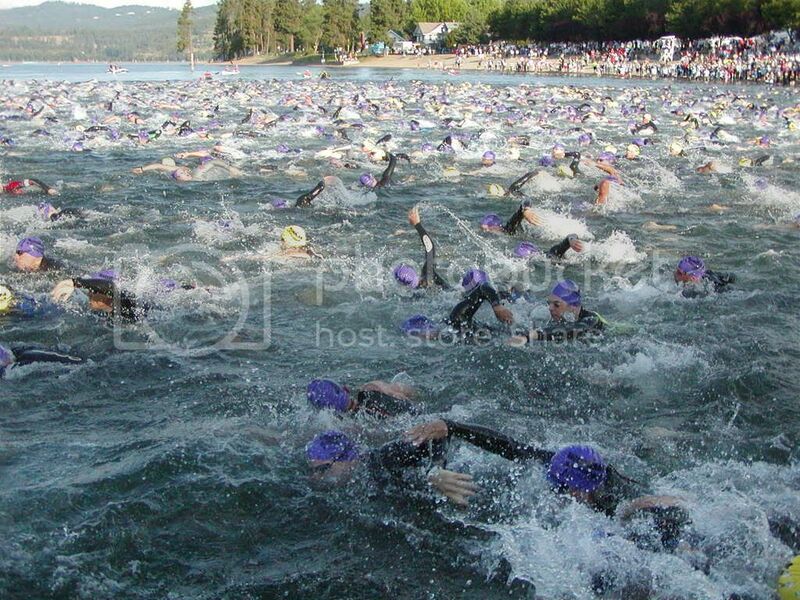 My sponsor, TriSports.com, hosted the opening event of this years TriFest weekend…the Mt. Lemmon bike ride. Aprox. 150 people showed up for this annual event. We rolled out of TriSports at 7:00am-ish. It was a no drop ride through town to the base of the Mt. Lemmon climb. From that point it broke down into groups by ability and how far up you planned on going. I had bigger goals for the weekend so I had a set of goals in mind for the day. The plan…go hard for the first 3 miles then ease up and cruise to the Bear Canyon (about mile 12). I stuck to my plan and got 4300 feet of climbing over the 12 miles. TriSports supplied a fuel stop at Bear Canyon. So after topping off my bottles it was a quick descent to the bottom and an easy ride back to TriSports. The weekend also doubled as a little training camp for Team TriSports, which meant we got the royal treatment…sandwiches, munchies and drinks upon our arrival! Next up was a great night of food and getting aqainted with my new and returning Team TriSports teammates at the team dinner. Pizza and pasta helped to refuel our bodies for the following days festivities. An early morning meeting of the team at TriSports started with a team photo shoot in our new LG tri kits…smile! We then mounted our bikes and rode the 13 miles to the Tucson JCC where we awaited our “mystery” workout. The workout was to be a sprint triathlon for the team…800 yard swim, 16 mile bike, 5k run. Knowing I had a race the next day I took it easy sort of! A navigational error on the bike made me the sole finisher of the “long course” race! Yay, me! We then mounted our bikes and rode back to TriSports. Upon our return, the TriFest activities were in full swing. Free taco’s for all that attended provided by Orca (thanks guys!) were enjoyed. Reps were set up from about 50 of the finest vendors. New toys to drool over included Campy’s electronic groupo, Sram’s new Red groupo, some interesting news on the new Quarq Sram Red cranks, Steve Fleck showing off the new goods from Nineteen, the P5 (way more impressive in person), free shoe fits by Sidi, Gatorade sampling out it’s new chew’s and so much more. And fortunately packet pickup for the next days race was there also. I then headed home to get a few minute’s rest and prepare my gear for the race. Then it was back to TriSports for the VIP party…good food, geleto, live music, casino night and great people. Sunday began at 4am with the sounding of my alarm. 4 eggs and a glass of water for breakfast. A 30 minute drive to the U of Arizona. I grabbed bike and all of my gear (neatly packed in my new Team TriSports TYR Elite transition bag) and set up my transition. Basic set up…helmet on bars, bike shoes on peddles, number belt and glasses in hat, hat and shoes on towel…keep it simple=fast. I then got body marked by the great volunteers from the Tucson Tri Girls. I then got introduced to the new tri suit I would be sporting during the race for the TriSports photographer…the new 2XU Compression Trisuit (review to come later). Being in the last wave meant I had a lond 3 hour wait until my start, so I returned to my car for a snack, the tastey new Gatorade G Pro Series Pro Carb Energy Chews (fruit flavor), a bottle of Gatorade and a short nap. Afterwards I caught up with a few friends and as start time got nearer I got in a quick 10 minute warm up run followed by a 10 minute swim warm up. And finally it was time for the final wave consisting of the faster men. The horn sounded and I was off. 33 lengths of the pool…825 yards. My plan for the swim as always was to get into my pace fast and hold it for the whole distance. 11minutes 44 seconds later I was land bound…24th fastest swim. A short run to T1, helmet on, run to mount line, flying mount, get up to speed and put on shoes. The 12 mile bike course is 3 loops…slight downhill, right turn, slight downhill, turn right, rough road slight uphill, turn right, slight uphill, repeat and repeat. I quickly got up to speed and settled on my aerobars. The legs felt good dispites the building lactic acid. I began passing a few of the faster swimmers and then was passed (like I was backpeddling) by my long time rival and friend Marty Mares. I continued to hammer through the course traffic. The wind was gusting a little as the bike leg progressed. Coming down the final stretch I began preperation for transition…Unstrapped shoes and took the feet out. As I approached the dismount line I threw my leg over the bike and stepped off at the line running a direct line to my rack area. I racked my bike, removed my helmet, slipped on my running shoes, grabbed my hat with contents and was off for the run. Total time for T1/bike/T2 was 30minutes 17seconds…6th fastest of the day! As I ran out onto the course I put on my hat, sunglasses and race number belt. The legs felt a little tight but I was going to give it my all to try to run my way up the placings. The course is basically flat, two loops of the UofA mall area…3 miles. The temp was starting to heat up. 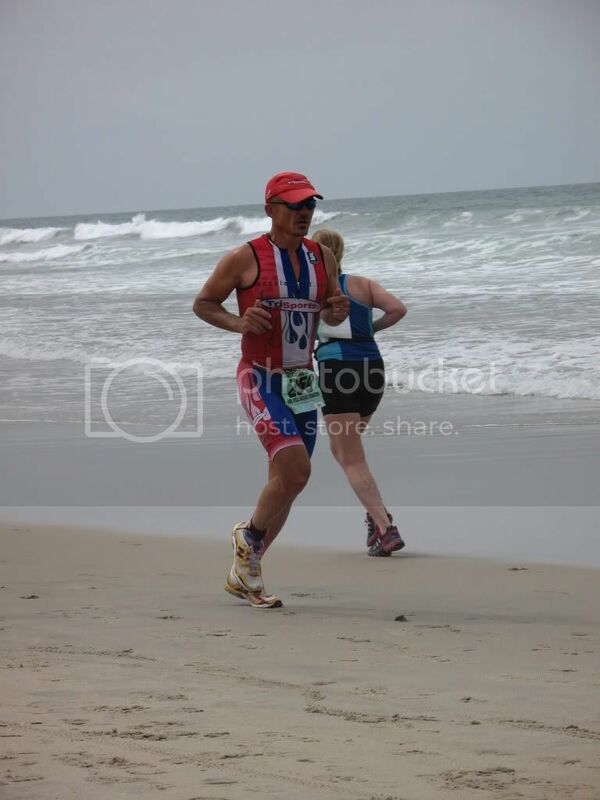 I was running well and passing people from earlier waves and hopefully my wave…it was hard to tell some times. On the second loop I could hear someone sitting in behind me with heavy foot strikes with 1 mile to go. He quickly moved to the side and passed me. I stayed with him for a minute or so and then a gap opened up. He put about 15 meters on me and I kept him in sight…he was in a younger agegroup but overall places were still on the line. With less than 1/2 mile to go he broke…stopped and bent over at the side of the course. I regained the place and headed for the finish line crossing totally spent. Short races HURT! Run time…19minutes 5seconds…10th fastest of the day. My race goal was to break the 1 hour mark…didn’t happen. Probably a little to busy of a weekend! But I was satisfied with my effort. I finished in 1:o1:06…8th place male and 2nd in my agegroup (I will be hunting you Marty!). I had a great day and my Team TriSports teammates filled the podium (Thomas Gerlach and Bryce Phinney 1st and 3rd overall, Kye Gilder 3rd agegroup and Allison Stewart 2nd female overall). 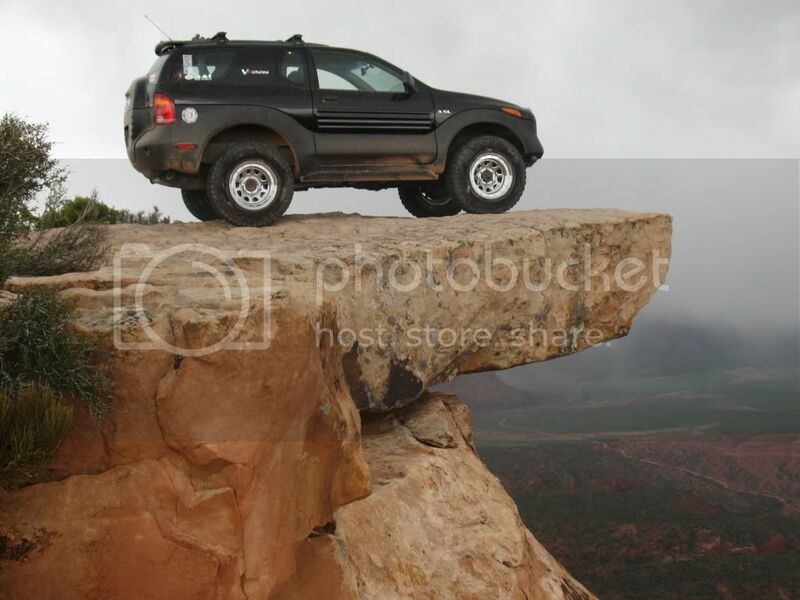 This entry was posted on March 26, 2012 by Billy O. It was filed under bike, multisport, run, swim, Triathlon and was tagged with bike, lemmon, mt., run, swim, triathlon, trifest, trisports.com, Tucson. Nice photos – are those the ones from Zachary?? Thanks, they were taken by wife wife!